Leh, the capital of Ladakh is situated towards the eastern parts of Jammu and Kashmir. It lies on the crossroads of the historic ‘Silk Route’ from Sinkiang to West Asia and to the plains of India. Leh Arrive in Leh airport at 09:00 hours from Delhi. Meet and transfer to Hotel. Day at leisure to acclimatize with the altitude, lunch in between at 13:00 hours. Late afternoon at 16:00 hours go for short tour of Leh town including Samker Gompa, 3 Kms up from Leh town, which is open to visitors in the morning and evening only. The Gompa, built in around 18th Century, is the seat of the Head Lama of Ladakh & founder of yellow sect, Tson- Kha-Pa. After Samker, visit Leh Temple & walk back to Leh Bazaar through the famous Leh Polo Ground. Back to hotel by 18:00 hours; dinner and overnight stay at Hotel. Leh After breakfast at 09:00 hours proceed for a day trip to Gurudwara Pather Sahib, Hall of Fame, Magnetic Hill & Conﬂuence Point (Sangam). Packed lunch in between at 13:30 hours. Evening at 17:00 hours return to Leh hotel for dinner & overnight stay. Leh- Pangong Lake Morning after early breakfast at 07:30 hours leave for Pangong Lake (5 hour drive) through Changla Pass. While ascending Changla Pass (5,486 Meters), enjoy the panoramic view of villages below the pass. Arrive Durbuk followed by lunch and from there a short drive takes you to the western shore of the lake. Check in to a deluxe camp near the lake. Dinner at 19:00 hours & overnight stay at Camp in Pangong. 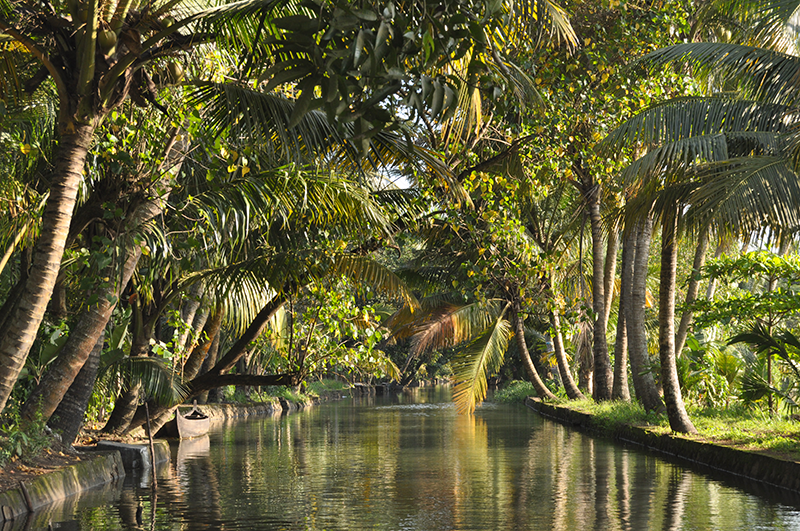 Kumarakom- Alleppey- Houseboat Morning after breakfast at 10:00 hours check out from hotel & drive to Alleppey. On arrival, Pangong Lake- Leh Breakfast at 07:00 hours and start your day enjoying the landscape in the back drop of the Lake. 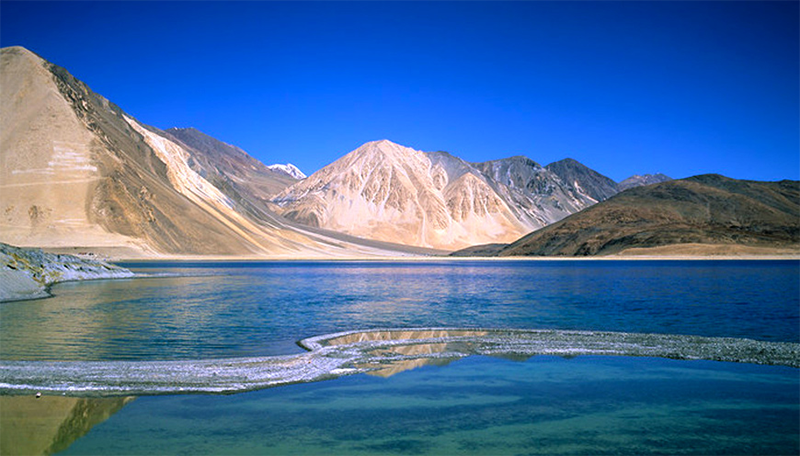 This famous blue brackish Lake of Pangong is approx. 5 Kms wide and over 144 Kms long. Lunch in the camp at 12:00 hours and check out. At 13:00 hours start drive to Leh. Arrive Leh by 18:00 hours. Check in to hotel for dinner & overnight stay. Nubra Valley- Leh Morning at 07:30 hour breakfast at the camp. Later at 08:30 hours check out & drive back to Leh, lunch enroute in a local restaurant. Reach Leh by 16:00 hours, check in to hotel. Evening free to explore market and city centre of Leh. Back to hotel at 18:00 hours for dinner & overnight. After breakfast at 08:30 hours check out from the hotel & drive to Dharamshala (Approx. 7 hours drive), lunch enroute restaurant. On arrival check in to hotel. Late afternoon visit Official residence of Dalai Lama the exiled Tibetan Leader from outside & the adjoining monastery. At 17:30 hours back to hotel for dinner & overnight. Leh- Delhi Morning breakfast at 07:00 hours, check out and transfer to airport at 07:30 hours on time to board return ﬂight leaving at 09:00 hours to Delhi..